Discussion in 'Holiday Cooking' started by Gingerbug, Jul 15, 2008. "A chunky chutney like this one makes a great gift for friends and neighbors. I give them the chutney in a decorated jar with a package of cream cheese and a box of crackers. It makes a lovely snack and is just as good alongside a main dish. --Cheryl Lottman Stillwater, Minnesota"
2. Store in the refrigerator. Serve over cream cheese with crackers or as a condiment with pork, ham or chicken. "In October, my husband helps harvest cranberries at a friend's bogs, so I have access to the very freshest ingredients. Their bold autumn flavor pairs up perfectly with sweet potatoes to make a seasonal side dish my family looks forward to." 1. Place sweet potatoes in a Dutch oven; cover with water. Bring to a boil. Reduce heat; cover and simmer for 40-50 minutes or until tender. Drain. When cool enough to handle, peel potatoes and cut into 1/4-in. slices. Place half in a greased 2-1/2-qt. baking dish. Top with half of the cranberries, brown sugar and butter. Repeat layers. Pour orange juice over top. 2. Cover and bake at 350 degrees F for 30 minutes. In a bowl, combine the walnuts, brown sugar and cinnamon; cut in butter. Sprinkle over sweet potato mixture. Bake, uncovered, 10 minutes longer or until topping is golden brown. "During the holidays, I make several pans of this sweet cake-like corn bread for family and friends. Whole blueberries--coated in flour--can be used in place of the cranberries." 1. In a mixing bowl, cream butter and sugar. Add eggs; mix well. Combine the flour, cornmeal, baking powder and salt. Add to creamed mixture alternately with buttermilk. Fold in cranberries. 2. Transfer to a greased 9-in. square baking pan. Bake at 375 degrees F for 40-45 minutes or until a toothpick inserted near the center comes out clean. Serve warm. "This is a simple and tasty way to dress up brussels sprouts for the holidays. The parsley, sugar and crisp water chestnuts make the sprouts fresh tasting and festive looking. -Dorothy Anderson, Ottawa, Kansas"
1. In a saucepan over medium heat, bring water, parsley, sugar and salt to a boil. Add brussels sprouts. Cover and simmer for 6-8 minutes or until tender; drain. Add water chestnuts and butter; heat through. Mash sweet potatoes: blend in remaining ingredients. Spread into a buttered 13X9" baking dish. Spread topping over top: bake at 300 degrees for 35 minutes. Serves 8 to 10. Blend together margarine, sugar and flour: add chopped nuts and stir. Layer butter, cauliflower and cheese in a 2-quart casserole dish. Pour milk over cheese: sprinkle with salt and cracker crumbs. Bake, covered at 375 degrees for 45 minutes. Serves 4 to 6. Preheat oven to 200 degrees c, gas 6. Peel the parsnips and quarter them. Then cover the parsnips with the honey and roast for a further 5 minutes. To serve, stack the parsnips on a plate scattered with the parsnip crisps. Using spoons dipped in hot water, scoop out the Pie D'Angloys in four portions and arrange on a platter around the parsnips. Mix the butter, sugar and water together in a pot. just tell the kids they are not old enough to like these beans. http://crockpotrecipes101.com/blog/2005/12/green-bean-casserole.html... since we don't have onion rings in a can in stores around here.... this recipe looks good! 4 to 6 medium red-skinned potatoes, sliced about 1/4"
Spray the pot with cooking spray or lightly grease withbutter. Layer sliced potatoes, sliced onion and green beans, sprinkling with dill and salt and pepper as you go. Dot with butter, about 1 tablespoon total, and add about 2 tablespoons of water. Cover and cook on HIGH for 4 hours (LOW about 8 hours). Stir in soup or sauce; turn to LOW and cook an additional 30 minutes. Serves 6 to 8. Optional: Add bits of cooked bacon for extra flavor. Melt butter in medium saucepan. Add all remaining ingredients except cheese and pasta and heat through. Ladle over warm fresh pasta. Garnish with cheese. Makes 8 servings. Preheat oven to 400 degrees F. Arrange the asparagus on a baking sheet. Coat with cooking spray and season with sea salt and pepper. Meanwhile, melt the butter in a saucepan over medium heat. Do not stir, just give the pan a little shake now and then until the butter starts to brown. Remove from heat and stir in soy sauce and balsamic vinegar. Pour over the baked asparagus to serve. Both of these sound so good and I just ate! 1. Heat oven to 350 degrees F. Spray a 13 x 9-inch baking dish with no-stick cooking spray. Heat water, butter, garlic salt and onion salt to boiling in a 6-quart Dutch oven or saucepan. Remove from heat. Add cream cheese, evaporated milk and sour cream, stirring until cream cheese is dissolved. 2. Stir in potato flakes, mixing until all ingredients are well combined. Spread mashed potato mixture into prepared pan. 3. Sprinkle with paprika and bake 1 hour or until bubbling around edges and golden brown. Top with chopped bacon and parsley, if desired. Before baking, potato mixture can covered and stored in the refrigerator up to 48 hours. Remove from refrigerator, sprinkle with paprika and bake as directed. Saute' onion in butter. Combine soup, soy sauce, and cheese in a meduim sauce pan. Add onion. Heat over medium heat until cheese melts, stirring constantly. Add Tabasco and pepper. Layer beans, water chestnuts, and sauce ending with sauce in a 9x13 pan. Bake 30 minutes at 350 degrees. Top with French Fried Onion Rings and bake an additional 10 minutes. I wasn't sure if this should be a side dish or main dish. At our house, it's a side dish during the holidays. It's pretty at Christmas if you use red and green bell pepper (or even some yellow thrown in). Saute’ onion, bell pepper, and mushrooms with butter until vegetables are just tender. Add pepper, salt, garlic powder, bay leaves, and shrimp. Cook over medium heat stirring constantly until shrimp turn pink. Add warm rice. Mix. Let sit five minutes. Remove bay leaves; serve. 1. Preheat oven to 400F and lightly grease a casserole dish with oil. 2. Peel the squash. Thinly slice off the bottom and top and then slice through the middle lengthwise to make two halves. Remove seeds & guts with a grapefruit spoon or ice cream scoop. Chop two halves into 1-inch chunks and place into casserole dish. 3. Add minced garlic, parsley, oil, and salt into casserole dish and stir until well combined with the squash. Do not add the kale yet. 4. Cover casserole dish with a lid (or tin foil with a few holes poked) and bake at 400F for about 45 minutes. 5. Meanwhile, process the parmesan ingredients together until chunky (or just chop by hand and mix in a bowl). Make sure to leave lots of nut pieces for texture. I used a mini processor and it worked great with minimal clean up. 6. After about 45 mins (or when squash is just fork tender), remove from the oven and reduce heat to 350F. Stir in the chopped kale and sprinkle the parmesan all over the squash. Bake for another 5-8 minutes, until the nuts are lightly toasted. Watch closely so you don’t burn them. Remove & serve! This handmade artichoke leaf pasta tastes just as good as it looks! Here we have paired it with leeks, toasted breadcrumbs and Pecorino. Step 1. Whizz up the crusty bread in a food processor then toast the breadcrumbs in a pan. Step 2. Cut the leeks into thin rounds using both the white and green parts. Cook them gently a frying pan with a little olive oil, then season with salt and pepper. Add a little water if they seem dry. Step 3. Take half of the leeks and blend them with a spash of olive oil in the food processor. Leave the rest in the pan. Step 4. Meanwhile drain the ‘al dente’ artichoke leaf pasta that you have cooked in a large pan of salted water following the instructions on the packet. Add the pasta to the leeks you left in the pan and then afterwards mix in the blended leeks. Step 5. 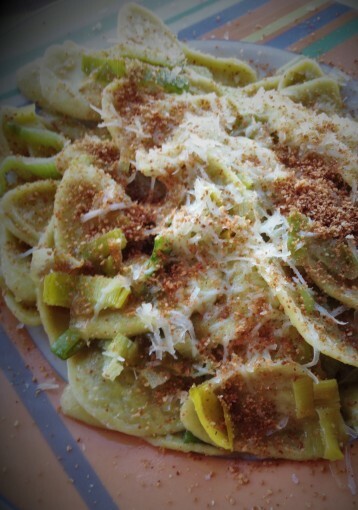 Serve with the toasted breadcrumbs sprinked on top with a generous handful of freshly grated pecorino cheese. This is super simple but very good! Easy addition to weeknight meals but yummy enough to help round out a holiday meal with more veg! Bake for 20 - 25 minutes, or until tender. Toss with a spatula half way through. Cook veggies just until tender and drain. Heat soup, milk, and cheese in saucepan until cheese melts. Pour over veggies in 2 quart round casserole dish. Bake at 350 degrees for 30 minutes. This is such an easy dish to put together. I make this every Easter, Thanksgiving, and Christmas. This dish gets at least "some" of my kids to eat their veggies! AuntJamelle, GrammaDeb and luludou like this.